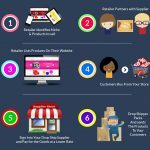 Today, we review one of the most reliable and fully-featured drop shipping solutions. 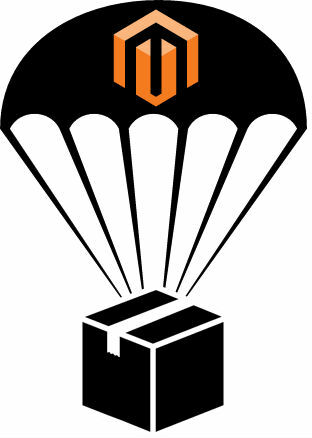 Meet the uDropship Magento 2 extension by Unirgy. After installing the module, you will get the ability to sell products from several vendors without headaches. Besides, the tool allows users to seamlessly manage inventory and handle order fulfillment. Compatible with most accounting, ERP, and backoffice systems. Let’s briefly describe the extension’s core features and then proceed to the backend section. So, what does Unirgy uDropship let you do when it comes to dropshipping? First of all, the module provides the ability to have multiple shipping origins per single order. It is especially useful when items from an order are not available in the catalog of a supplier, but they are included in your product listing. Instead of splitting the order into several parts, you can still create one but with multiple shipping origins. Wide support for built-in and third-party carriers is also among the core Unirgy uDropship features. The extension doesn’t limit you to a small list of predefined carriers, so you and your customers can choose the most convenient providers. 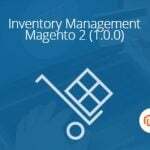 The Unirgy module enables Magento 2 store owners to select a vendor decision method for calculation of shipping costs and order fulfillment. One of the options is always to use a vendor associated with a product by default. Another possibility is to assign a local vendor if an ordered product is in stock and send the request for product shipment from a global vendor when it runs out of stock. Note that you can leverage extended vendor decision logic settings by installing the MultiVendor add-on that we describe below. 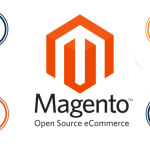 It is also necessary to mention that the Unirgy uDropship Magento 2 module allows you to use different vendors for product per website. This feature is especially useful if you sell abroad and run multiple stores aimed at different countries and markets. While you can sell the same products on various websites, it is possible to use different vendors to save time and reduce the cost of shipping. 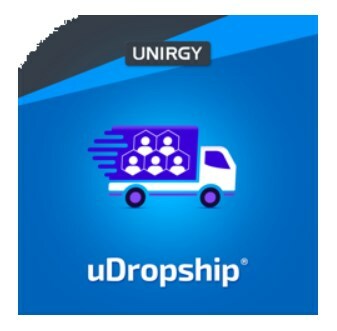 Pre-generated order shipments per vendor are available with Unirgy uDropship as well. As for the rates calculation, the Unirgy uDropship provides an automatic split calculation of dropship rates within a vendor package at the checkout. The feature allows merchants to estimate more precise shipping rates. 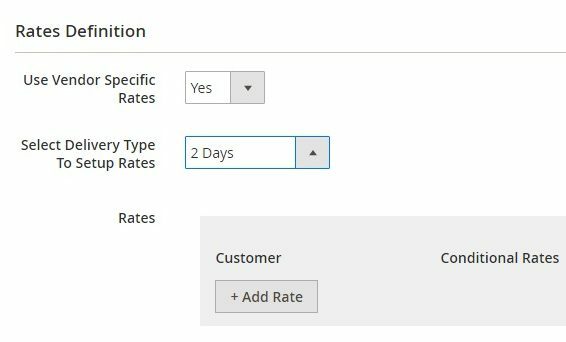 Moreover, the Magento 2 module introduces the fallback chain function for rates calculation. Another important feature is related to the checkout. The extension supports both internal and external checkouts, so your buyers can complete the purchase either on your Magento 2 store or via PayPal Standard/Express. As for vendor experience, the uDropship extension provides a user-friendly vendor control interface. After logging in the vendor portal in the backend, the users get access to the panel where they can manage inventory, process orders, modify settings, and more. Every time a new order is created, all vendors related to it automatically get a notification via email. Also, it is possible to send timely alerts to vendors informing about products which stock is running low. In its turn, a vendor can send comments to a store owner asking questions or providing additional details. Comments are sent via email and logged in the order shipment history. As for the notification system, it is also aimed at buyers. Customers get automatic shipment notifications with all the necessary information. 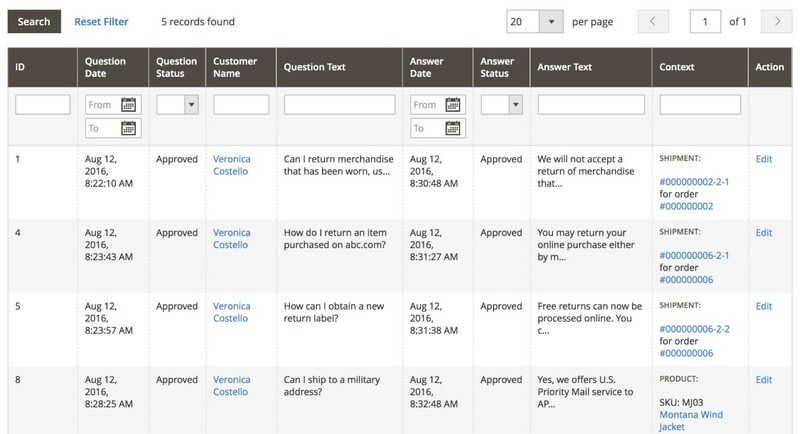 A store owner can decide when customers should receive notifications: when a vendor’s part of the shipment is complete, after adding a tracking ID and creating a shipping label, or after generating auto-invoice. Unirgy uDropship provides packing slips that are generated automatically and substantially simplify the life of vendors and customers. Note that packing slips are available in a PDF format and can be downloaded and printed. The same is about thermal (EPL) shipping labels used for FedEx, UPS, and USPS. Both document types related to a vendor’s part of the order can be attached to vendor email notifications. Besides, you can leverage the poll carrier tracking API to track the package pickup from a vendor’s location globally. Note that currently this function is available only for FedEx. Furthermore, the uDropship extension by Unirgy allows generating financial statements manually or automatically and submit them to vendors. The statement represents a financial report that gathers vendor orders which obtained a specified status within a time interval. Vendor statements are generated in PDF, can be downloaded, and sent via email. It is possible to customize the financial documents by including info like a store name and address as well as a logo image in the letterhead. The Magento 2 module also provides the possibility to calculate vendor payouts automatically. Store owners can specify commission percentage that should be deducted from the payout, as well as a flat transaction fee. Besides, the extension enables users to leverage the advanced configuration of vendor handling fees. With the module, it is also possible to set vendor tax calculations based on the vendor location. Another vital feature available with uDropship is disabling inactive vendors on the global level. Thus, you can simplify the admin routine by avoiding manual modification of the products availability for vendors that are not active or deleted in the backend. Note that the Unirgy uDropship Magento 2 extension offers several important add-ons. Responsive Vendor Portal Theme ($199). The theme has a simple design with visually attractive elements for a better user experience of vendors. The add-on is optimized for mobile devices and allows using resize, pan, and scroll functions on various types of tablets and smartphones. The plugin includes a pack of fonts and icons and provides the multi-menu navigation function with sticky page titles. Besides, the theme can be customized to better fit into your website’s style. 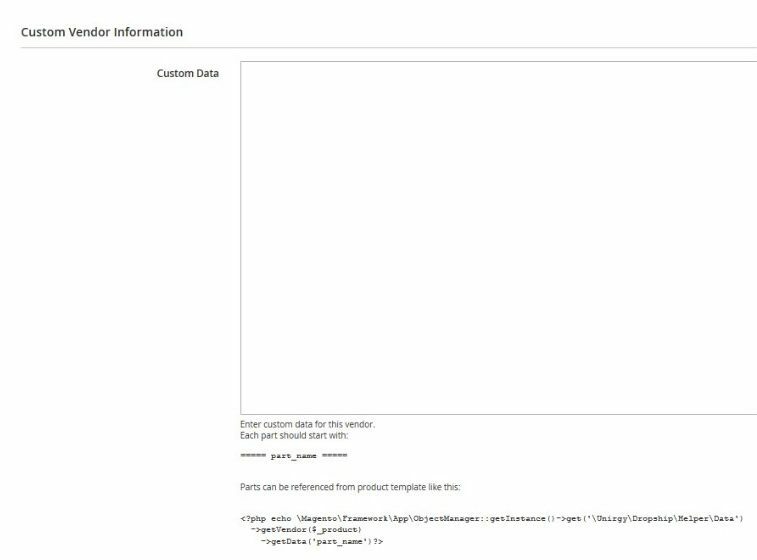 Note that Vendor Portal Theme requires the latest version of uMarketplace Suite to be installed and has full integration with all its functions and add-ons. AdvancedPO ($290). This add-on offers a more flexible management workflow. It utilizes parent record in PO and Shipment IDs for easier identification (e.g., if an order number is 345, then PO gets 345-12, and shipment will be 345-12-2), offers auto-generated vendor POs (they can be created manually as well), and provides the ability to create multiple POs per vendor per order. Besides, with the add-on, it is possible to separate PO PDFs and shipment packing slips, create partial item shipments from the vendor interface, and use automated invoicing for shipped products only. Payout ($290) is another add-on that allows reducing time on generating vendor payouts since everything is performed automatically. Alternatively, you can still create payouts manually. Payouts on shipment and periodic statements are also among provided features. Note that the add-on offers PayPal as a bundled payout method. At the same time, you can create custom payout methods both offline and online. It is also necessary to mention that you can track payouts in both vendor statements and admin interface. MicroSite ($290). With the help of this addon, you create a place where vendors can register. Next, admin users can approve or decline the vendor’s request. Besides, the add-on provides the ability to handle vendor subdomains that offer product filtering as well as custom landing pages. Furthermore, each approved vendor gets limited access to your store with the ability to manage associated products. As for new inactive vendors, they can only view their products after logging in. It is also possible to set a staging website for new products supplied by vendors. MultiVendor ($290). The MultiVendor add-on allows you to manage multiple vendors for a single product. Besides, you get full control over vendors’ stock levels and vendor-specific SKUs. As a store admin, you can change a vendor per item in the order after it was placed. From the vendor perspective, this add-on allows editing such parameters as product SKUs, Cost, and Stock Qty. Furthermore, the tool implements vendor decision logic based on the minimum number of packages and the lowest cost of products included and provides the ability to create custom vendor decision logic plugins. Batch ($290). First of all, this add-on is aimed at import/export functionality. It lets you export new orders to vendors and import shipment updates back via multiple sources and destinations. Besides, the add-on provides custom CSV file templates for each vendor. It is also possible to send files by email and upload them via FTP, as well as save all or recent imports and exports in the log. SplitRate ($190). The functionality of SplitRate includes the ability to split products in a shopping cart by vendors. Besides, it allows setting different shipping methods per vendor product group. Note that the add-on doesn’t allow handling multiple shipment choices for a single order in case of external checkout. uReturns (RMA) ($290). You can fully leverage this add-on to provide and manage vendor-direct return and exchange workflow, configure RMA approval, send automated return notifications, and get a centralized view of exchanges and returns. MultiTableRate (Free). This free add-on allows you to connect the Unirgy uDropship Magento 2 extension to the WebShopApps Matrixrate module. As a result, each vendor can have special table rates. GeoProximity (Free). GeoProximity is another free add-on that allows making your dropshipping more vendor-friendly. It utilizes a vendor decision logic: minimum number of packages and geographic proximity to a customer. Note that the add-on has lots of requirements, including the installation of the latest uDropship version, uDropship Locator, uStoreLocator, and uGeoIP (to be able to use the GeoIP method). Locator (Free). This one allows users to connect Unirgy uDropship to uStoreLocator for synchronizing geo locations with vendors automatically. As you can see, there are 11 additional plugins that extend the default functionality of the Unirgy uDropship Magento 2 module. Let’s see, how things are done under the hood of the extension. 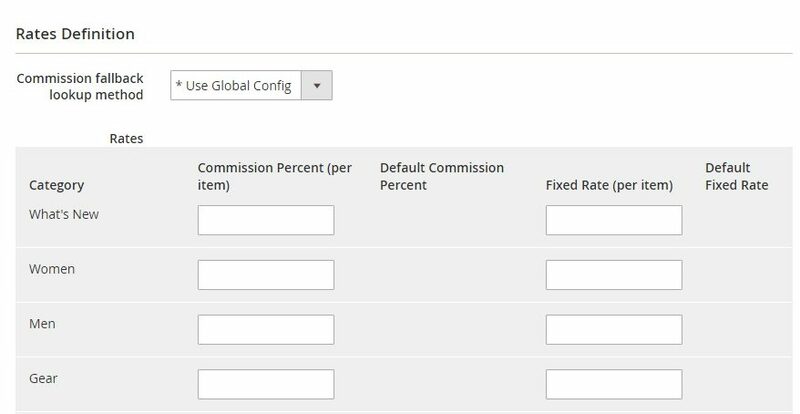 The extension settings are available under Sales -> Dropship in the Magento Admin. Here, you will see 10 sections: Vendors, Shipping Methods, Label Batches, Vendor Statements, Vendor Registrations, Purchase Orders, Payouts, Customer Ship Classes, Vendor Ship Classes, and Returns. manage customer questions and reviews. The Shipping Methods grid illustrates each method’s code and title, days in transit, store view, system methods, as well as customer and vendor ship classes. It is possible to delete selected shipping methods in bulk. While adding a new method, first, you will need to specify shipping information: Shipping Method Code and Title, Days in Transit, and Websites. Next, it is possible to enable/disable associated system methods: DHL, Federal Express, Flat Rate, Best Way, Free Shipping, United Parcel Service, United States Postal Service, Tier Shipping. The Titles tab allows you to set a default title for all store views, as well as create store view specific titles. 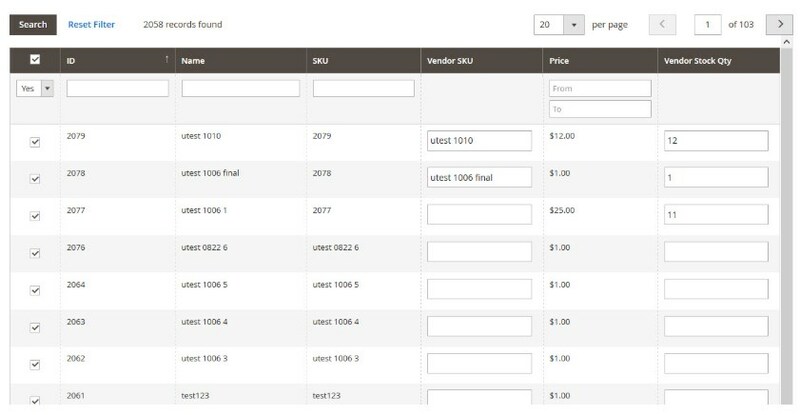 In Label Batches, you can download all labels via a convenient grid that shows a label ID, creation date, title, corresponding vendor, label type, and the number of shipments. The grid allows downloading labels in one click from the Action column. The Vendor Statements grid provides information in the following columns: ID, Created At, Statement ID, Vendor, Period, # of Orders, Total Payment, Total Paid, Total Due, Sent. You can generate statements with the help of a button available above on the right. As for the Vendor Registrations grid, it shows Registration ID, Vendor Name, Email, and Used Carrier. All purchase orders are gathered in a grid as well. It consists of the following columns: Purchase Order #, Purchase Order Created, Order #, Order Date, Ship to Name, Vendor, Method, Shipping Price, Total Cost, Total Qty, Statement Ready At, Status, and Action. The Vendor Payouts screen allows you to generate payout for a specified period. You only need to hit the “Generate Payouts” button. All the necessary information about each payout is available in a grid. Below, you can see how the Customer Ship Classes page looks. 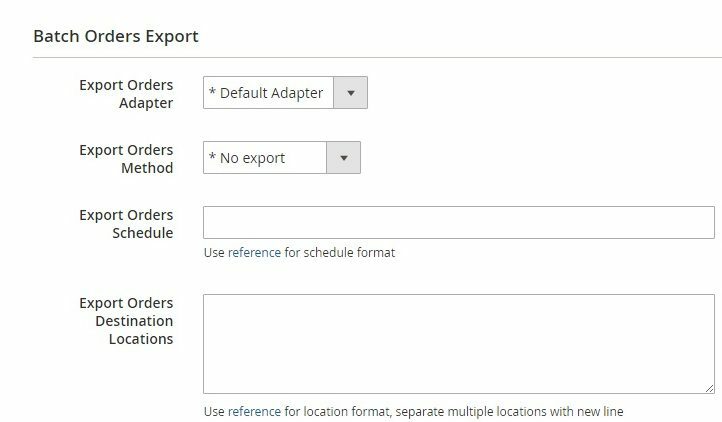 While adding a new class, specify its name, sort order, and select applicable countries. There is also a separate grid for managing returns. It shows Return number, the Return Created date, Order number, Order Date, Shipper Name, Status, Vendor, Method, Tracking Price, and Action. As for the Unirgy uDropship Magento 2 extension configuration, it is very complex but at the same time powerful and precise. The settings are located under Stores -> Settings -> Configuration -> Sales -> Drop Shipping. Here, you can fine-tune literally every aspect of the module. The configuration section is divided into 14 sections. 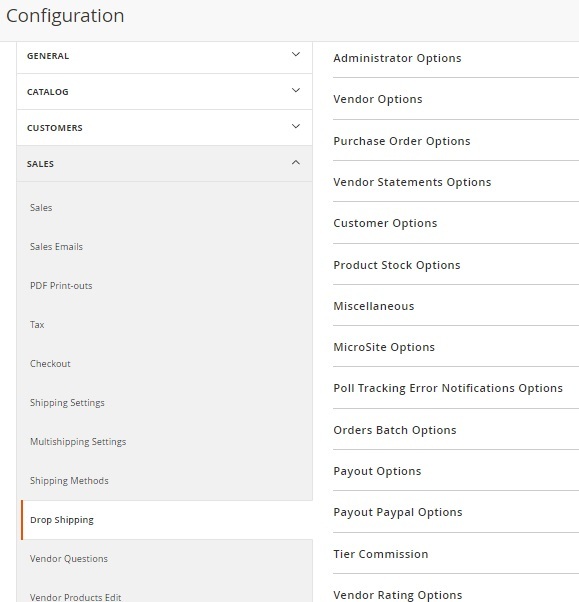 They are: Administrator Options, Vendor Options, Purchaser Order Options, Vendor Statements Options, Customer Options, Product Stock Options, Miscellaneous, MicroSite Options, Poll Tracking Error Notification Options, Order Batch Options, Payout Options, Payout PayPal Options, Tier Commission, and Vendor Rating Options. Besides, there are some other tabs with settings related to Drop Shipping in the Sales Section. Even in comparison to Magestore Dropship and Boost My Shop Drop Shipping, Unirgy uDropship looks gorgeous. Perhaps, it is the most complex extension in the ecosystem, and, due to the add-ons, the module covers all possible aspects of dropshipping. 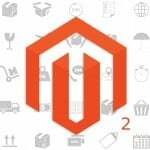 At the same time, Unirgy uDropship is the most expensive dropshipping solution for Magento 2. The extension itself costs $950, while most of its add-ons cost $290. Is it a reasonable price? Without a shadow of a doubt, we say Yes. If you are looking for a monster solution that covers all ecommerce needs related to dropshipping, Unirgy uDropship is the module that will fully satisfy your requirements. If your budget is limited and you need only some basic features, pay attention to Boost My Shop, Magestore, and other vendors.